This is a unique toy typewriter! A 3.5-inch width piece of paper is first advanced into the carriage. A cylinder, with upper and lower-case English alphabet letters, is manually rotated to the desired letter. 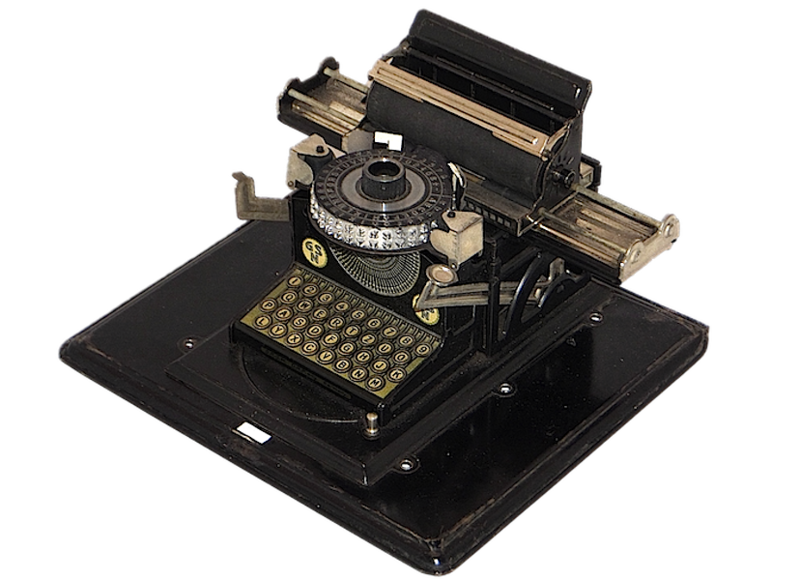 A lever is pressed, causing the entire carriage to move forward towards the cylinder, and the letter is printed onto the paper with inked typewriter ribbon. The typewriter keyboard is illustration only and the letters are not in standard typewriter position. This item was in my family in west-central PA and I’m guessing was probably played with by my mother and her siblings in the mid-1920s to ’30s. Internet research has revealed that GSN stands for Gebruder Schmidt, a toy manufacturer in Nuremberg, Germany, which began making these typewriters in the 1920s. Just below the “keyboard” are the letters “D.R.F.M. D.R.P.ang. Germany,” a statement having to do with patenting and registering. The typewriter and its carrier lid is in good condition and recently won second place in the antique metal toy category at the North Bannock County Fair antiques exhibit, Pocatello, Idaho. I am hoping to find an appreciative and caring home or museum for this piece! And thus it has found an appreciative home. Normally, I do not collect toy typewriters, but this one is so very elegant that I was eager to acquire it. The index mechanism is a stunning piece of engineering, so precise that it might rival standard index machines. Note: It is missing two knobs on either side of the platen and one tab on the left side, but it is otherwise whole. I’ve seen them sell for as little as $45 and as much as $200 and up. In some instances, condition is a factor, but generally it’s a question of demand. As for parts, the best I can say is buy another (especially if you can get one cheaply) and part it out. It is a fine-looking machine. Mine is only semi-operational.